Please sign this petition to the APA in protest of the highly questionable qualifications of the working study group. Is the American Psychogical Association allowing rampant and unchecked professional violations of ethical code and standards, making it complicit with acts of child abuse? Have you been denied access to your child? No parenting time or phone calls? Is your relationship with your child continually interfered with? Contact denial is child abuse. 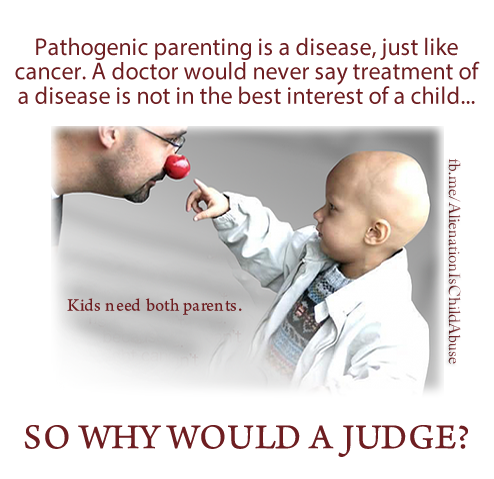 Pathogenic parenting is a child protection issue, NOT a child custody issue. Children have the absolute right to love both parents without being manipulated, bullied or coached. Emotional and psychological abuse cause the same chemical reaction in the brain as physical or sexual abuse. Don't be an apathetic bystander. Be a voice for the voiceless. Stand up for children by signing Dr. Childress' petition today. Parental alienation is pathogenic parenting. It is a form of child abuse and domestic violence performed by a hostile aggressive parent against the other, targeted parent, using their child(ren) as a weapon during a child custody dispute between unwed, separated, divorcing or divorced parents. Typically the pathogenic parent has interloping personality disorders that may include Munchausen Syndrome by Proxy (MSbP). Most frequently, the personality disorders of pathogenic parents appear in the combination of narcissistic personality disorder and borderline personality disorder or very strong traits of each. This pathogenic parent will use tactics of gaslighting, FEAR, OBLIGATION and GUILT to control and distort the child's perception of reality. The diagnosis "Parental Alienation Syndrome" is not included in DSM-5, however, a diagnosis of pathogenic parenting referred to as "Attachment Based Parental Alienation" by Dr. Craig Childress, does exist under other labels. Guess what else is not listed but is included under other labels? You will not find the terms psychopath or sociopath in DSM-5. They are listed as "Antisocial Personality Disorder". ﻿In the latest release of the American Psychiatric Association's (APA) Diagnostic and Statistical Manual of Mental Disorders, DSM-5, the diagnosis of pathogenic parenting is listed under codes V995.51 Child Psychological Abuse, Confirmed, V61.20 Parent-Child Relational Problem, V61.29 Child Affected by Parental Relationship Distress, and 309.4. According to Dr. Childress, the diagnostic indicators present in children for a diagnosis are (1) Attachment System Suppression (2) Personality Disorder Traits and (3) Delusional Belief. As the diagnoses for pathogenic parenting exist within DSM-5, any claim that further research is needed is negated. Please support awareness and law reform by visiting the Awareness Store and purchasing a tee shirt, car magnet, or other item.